Hillhouse has sweeping views of Midmar dam and the idyllic Midlands countryside. Situated on a farm, Hillhouse is private, has plenty of space, all the necessary comforts, and lots of style. Hillhouse is ideal for weddings. The large, open, converted shed comfortably holds up to 100 guests indoors. There is also an option for the bride, groom and 14 wedding guests to be accommodated in the Natal Midlands overnight, to extend the celebration. Exchange vows under the trees, set up picnics on the lawn outside, party all night long and enjoy the beautiful surroundings. You may choose your own caterer. 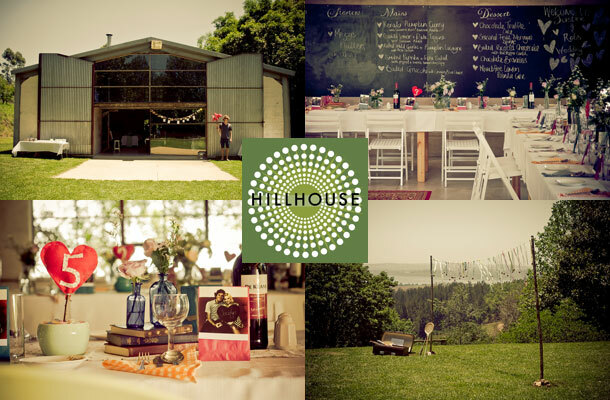 Hillhouse is also available for conferences, workshops, or any big celebration. Photographs: Taken by Tyrone Bradley at Rob and Justine’s Wedding. If you would like to book Hillside send an enquiry at Hillhouse. Looks like an AMAAAAAZING wedding venue!! Thanks Kelly, have a look at the website and come and stay for a weekend. please could you email me prices on the venue and what you offer. Thinking of a picnic wedding. Hi Yonande, yes a picnic wedding would be lovely. I have all the pricing and wedding info in an a file which I’m not sure how to attach here, but if you email me at crooks@nitrosoft.co.za I will send the info to you.